Deborah Amos ia an award-winning correspondent for National Public Radio and author of Eclipse of the Sunnis: Power, Exile, and Upheaval in the Middle East (2010). 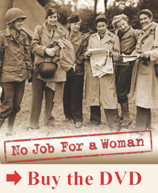 She appears in “No Job For a Woman”: The Women Who Fought to Report WWII. Please see Deborah Amos describe how she knows whens she has found a war story.